Roopairs is a Cal Poly startup, and Business to Business software company aiming to bridge the gap between service providers and Restaurants. The mobile “on-demand” platform connects restaurants with service workers so commercial equipment is properly maintained and repaired at all times. The co-founders Ray and David Bartolomucci have deep roots in the industry, and are looking for a new website. 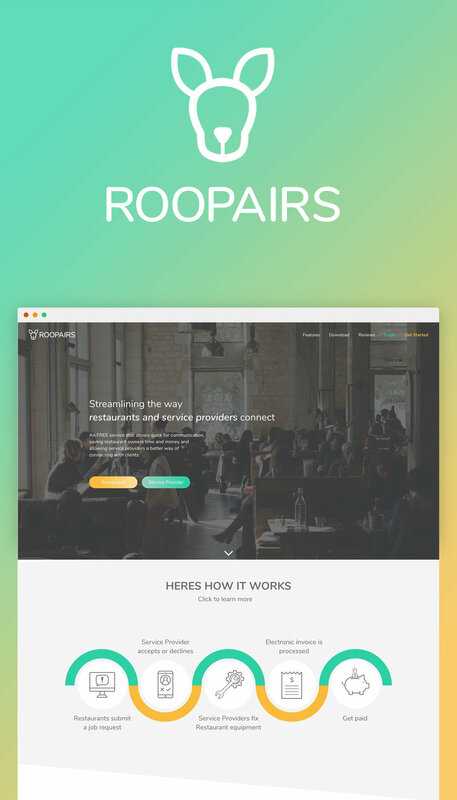 Roopairs current website was unfit for the message they were attempting to convey to their three audiences: Restaurants, Service Providers and potential investors. My team was tasked to create a website with a space to satisfy the answers for each of these groups as well as display and convince why Roopairs is the company they should choose to partner with. 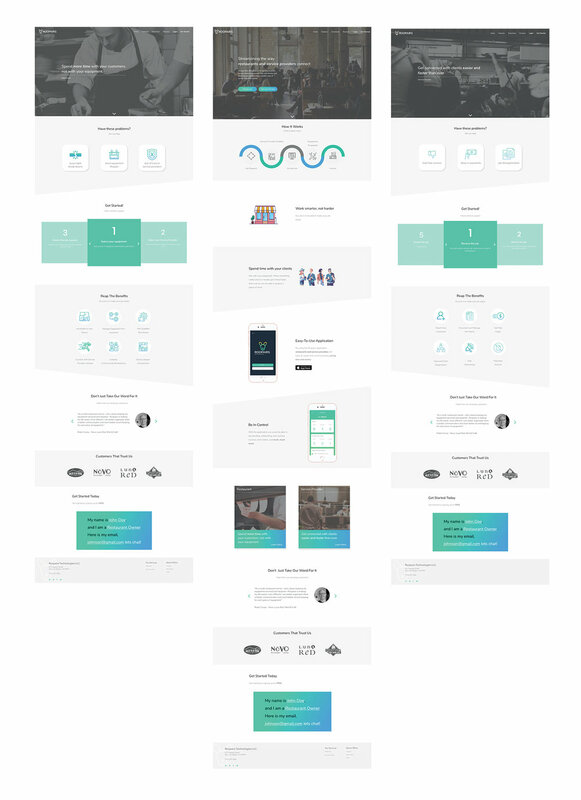 At the very start of our project, before any design thought was put forth, we created the document to the right as our information architecture. Yes, a bit messy, but this served as the foundation of which we built our final project. 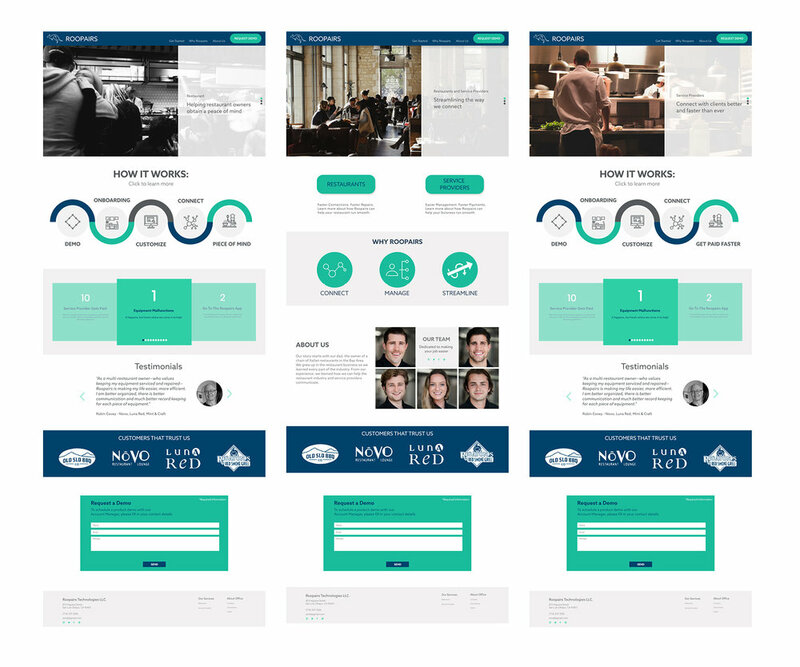 The information architecture had to encompass the three distinct target audiences that Roopairs was trying to reach, as well as making it easily navigable and logical. We wanted to have easy navigability for clients coming to look specifically for information that will benefit and encompass their company, whatever the three audiences it may be. 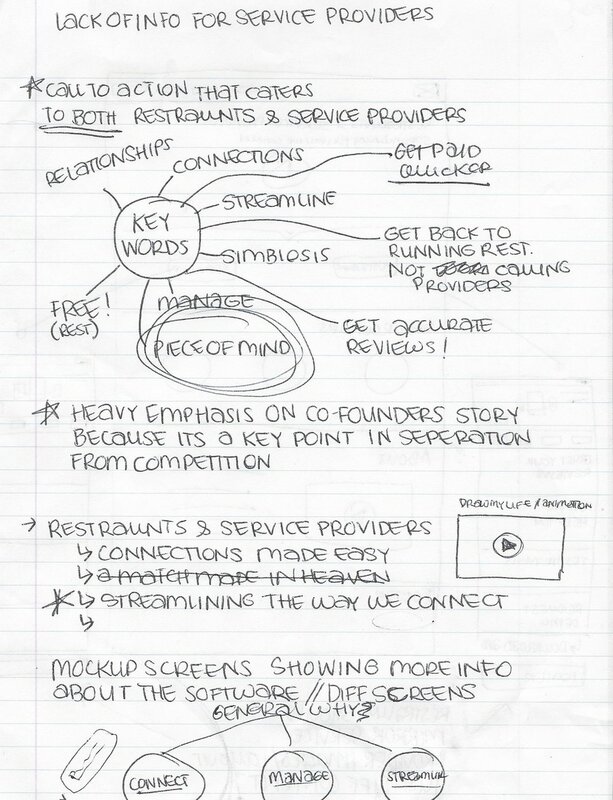 Before we began any prototyping we wanted to make sure that we were on the same page with the client. They didn’t provide set in stone content so we had to dig through their presentation materials to gather what we believed should go on each page. To the right is a mind map we made to get out overarching themes and general ideas to run by the client before moving forward. How do we go about addressing service pros and restaurants generally without being to specific to either on the home page? Coding as a team proved to be no easy feat, but with a good system down we were able to divide and conquer. We attempted to remain as true as we could to our final Prototype design, only making changes where we saw was completely necessary. Some considerations we had to keep in mind while we completed the coding process were: Media Queries for mobile version as well as creating an interactive element to keep users engaged throughout the site. 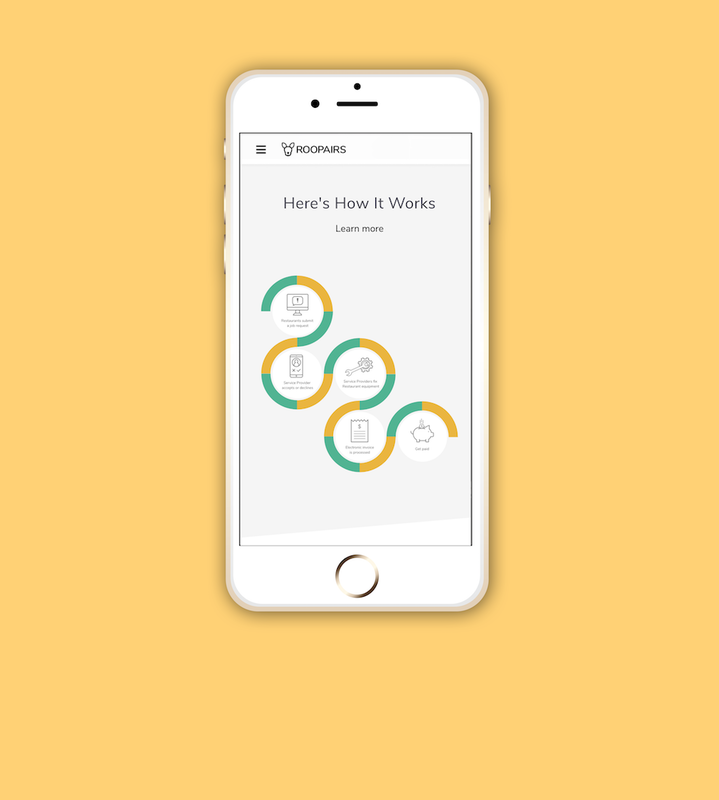 We utilized this interactive feature to demonstrate the steps it takes to use the Roopairs service. The three steps above correlate with the Restaurant side of the website, we also included a five step process on the service providers side. The final Roopairs site made use of a lot of icons, to break up the repetitiveness of the icons we wanted to include some motion to add more visual interest to the page. We included a set of four on both the Restaurant and Service Providers sides. Forms can be boring, and sometimes intimidating. On our final site we used a form that mimicked a natural conversation to remove the robotic like feel of filling out a form. We hope that this increases the amount of people that reach out to Roopairs. Roopairs provides extensive service to both Restaurants and Service Pros. We wanted to make sure we highlighted that within the site. Included in the image slider is screens from the Roopairs application to highlight the key features. One of the key elements that our client stressed to us was that they wanted to make it very clear that this application was for both the service providers and the restaurant owners. We included many options throughout the website so that a potential client wouldn’t miss their opportunity to learn more specific benefits Roopairs could bring to their business. Additional call to action half way down the home page. Our mobile version, just as much as our web needed to be able to display the information clearly. 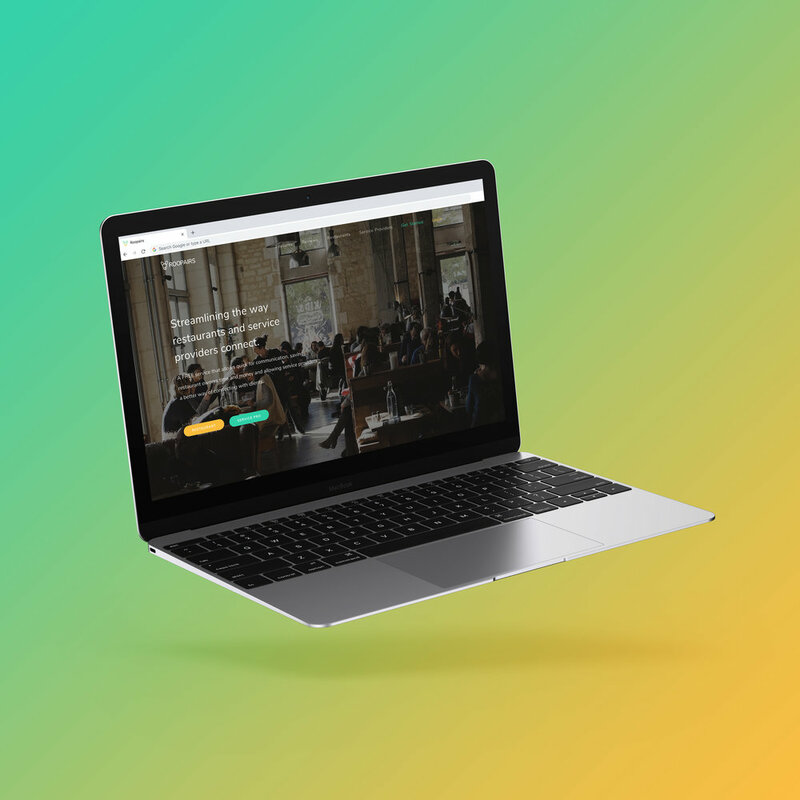 The entire Roopairs website is resizable as a mobile version, my team utilized media queries in the coding process to create this seamless transition. When viewed at a smaller size some of our key graphics began to loose their functionality. For that reason we created alternate layouts of some of our key displays so that they didn’t loose legibility when viewed in a different size. 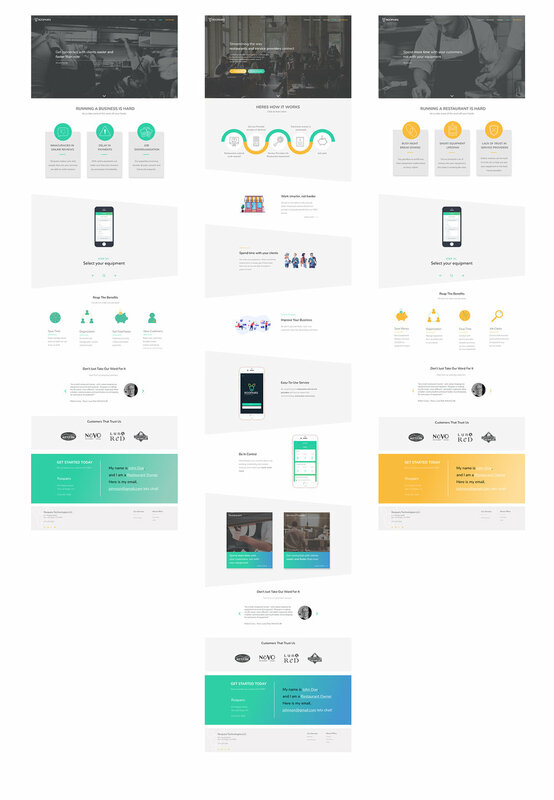 To the right are some of the highlights of the Roopairs mobile website.